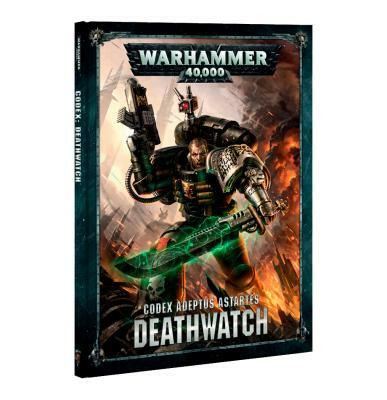 Codex: Deathwatch contains a wealth of background and rules – the definitive book for Deathwatch collectors. Within this 104-page hardback, you’ll find: - A history of the Deathwatch, focusing on their origins as the ultimate defence against the encroaching xenos threat and their expanded role due to the sundering of the Imperium due to the opening of the Great Rift; - Explanations of the Deathwatch’s place in the greater Imperium – how they work alongside the Ordo Xenos, how they select their number from the greatest warriors of every Space Marines Chapter, and the Ultimaris Decree, an order from Roboute Guilliman that bound every Primaris Chapter to the tithe of Deathwatch in perpetuity; - Tools of the Alien Hunter: each Deathwatch warrior is given his pick of the finest weaponry the Imperium has to offer, detailed in this section; - The Structure of the Shield: this section outlines the core structure of a Deathwatch base, the leadership of a Watch Commander and the various Companies they employ; - Heraldry of the Honoured: 6 examples of Deathwatch base heraldries; - The Ties That Bind: descriptions of the different types of Kill Team available to a Watch Commander, and the criteria they use to select them; - The Oathsworn Tithe: when a Chapter supplies Space Marines as part of their Deathwatch tithe, they keep their shoulder heraldries – this is a selection of those; - The Alien Stars: A map of Deathwatch bases throughout the galaxy, and their locations relative to major xenos incursions and the effects of the Great Rift; - The Vigil of Aeons: A history of major battles and events in the history of the Deathwatch; - Background on each unit available to a Deathwatch army; - A showcase of beautifully painted Citadel miniatures, with example armies featuring everything from individual images of models to battle scenes on terrain. Rules Everything you need to get a Deathwatch army primed for games of Warhammer 40,000 is in here: - 32 datasheets providing rules for using every Deathwatch unit in your games of Warhammer 40,000 – including Primaris Space Marines; - Army abilities that reflect the Deathwatch’s methods of war on the tabletop; including the use of Special Issue ammunition; - Armoury of the Deathwatch: profiles for all weapons and wargear of the Deathwatch, ranged and close-combat - Points values for all miniatures, weapons and wargear for use in Matched Play games; - Hunters of the Alien: Rules for Battle-forged armies, including: - 6 Mission Tactics: bonus abilities which last for an entire game; - 29 unique Stratagems, including 5 used specifically against certain xenos races – Tyranids, Orks, T’au Empire, Aeldar and Necrons; - Relics of the Vigilant: 6 weapons and artefacts available only to the Deathwatch; - Librarius Discipline: 6 psychic powers specific to Deathwatch models with the Psyker keyword; - 6 unique Warlord Traits for the Deathwatch; - 6 Tactical Objectives unique to the Deathwatch.